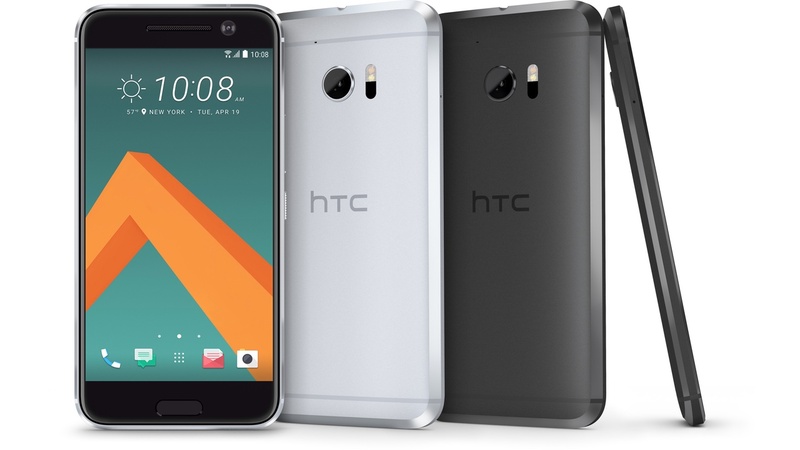 HTC's flagship line has been know as the One series. You've had the HTC One M7, HTC M8, and HTC One M9. Today, that title is getting shorted and the product title is simply know as the HTC 10. The title change kinda sums up the HTC in general, a flagship phone which dispatches a lot of bloat while adding useful features. Let's take a look. The HTC 10 is exactly what you'd expect from a flagship Android phone is 2016. The Display is 5.2 inches, a little bit bigger than the M8 and M9, and finally makes the jump from 1920 x 1080 Full HD to 2560 x 1440 Quad HD. Like Apple, HTC is still using a LCD variant, called Super LCD5, in lieu of AMOLED technology. At this point, LCD screens still have a few advantages over AMOLED, but that gap is narrowing every year. The larger display makes for a phone that nominally taller and wider, but its also thinner than the M9 and has a comfortable curved design. The system on chip is the Snapdragon 820. Unlike the 810 used in last year's flagships, the 820 is not a repackaged ARM reference design. The core is based around a quad-core Kryo CPU. Like the Krait in the Snapdragon 800 series, the Kyro is completely a Qualcomm design. It finally gives Android the power to hang with Apple's latest A-series CPUs. The GPU, the Adreno 530, is also much improved. The camera is 12mp with laser autofocus and OIS. That's on par with its main competition, the Galaxy S7. The front is 5MP and also has OIS. Correct me if I'm wrong, but this may be the first time a front camera has been stabilized. The aperture both front and back is f/1.8. For video, the front camera is 1080 while the rear is 4k. If you're looking to shoot video or photos, this looks like one really interesting device. Rounding out the hardware specs, there's about a dozen LTE bands, so it should be at home on any carrier. The LTE is also class 9 capable for speeds up to 450Mbps. I/O is what you'd expect with dual band AC wireless, bluetooth 4.2, NFC and a bunch of sensors. Physical connections are through USB Type-C at full USB 3.1 speeds. The SD Card slot stays and and take cards up to 2TB. Wirelessly, it supports not only the expected HTC connect, Google Cast, and Miracast, but very surprisingly Apple Airplay as well. That should be a great feature in if you're an Android user in an Apple Household. Rounding out the spec sheet is a further Improvement on the front-facing Boomsound speakers called Boomsound Hi-Fi. Its also got a 24-bit headphone amp, so high end audio aficionados should be pleased. Android's biggest weaknesses have been fragmentation and bloatware. Honestly, it's just confused and angered customers who, for the most part, have just used Google's apps. HTC and its Sense launcher have been among the worse. For the 10, HTC has gotten rid of many of its own apps except when it adds to the feature set, like the camera. It makes for a much cleaner Android experience. However, it does offer an interesting new launcher layout called Freestyle. This phone puts the user first, make no mistake. There's also some software level improvements that give the phone up to 30% more battery life. With hardware and software improvements, HTC is advertising up to two full days of charge. The HTC 10 is available starting at $699 with pre-orders starting today. The phone itself will be released in May. There will be be versions for most carriers as well as an unlocked version. The HTC One-series was never lacking on design, but never managed to full catch on. That is also the question here. HTC has designed one hell of a phone, they did their job. Their marketing department has their work cut out of them and if they fail there may not be a HTC 11. If any device can unseat Samsung, its this one.